At the 2019 Consumer Electronics Show (CES), L'Oréal has launched a prototype of the new innovation from the L'Oréal Technology Incubator. The first-ever wearable sensor and companion app—My Skin Track pH by La Roche-Posay—can effortlessly determine personal skin pH levels and produce custom-made product regimens toward better skin care. My Skin Track pH has received a CES 2019 Innovation Award, and dubbed a “Best of Innovation” winner in the Wearable Technology Products category. The innovative sensor was jointly developed with La Roche-Posay—L'Oréal’s skincare brand—which is dedicated to bringing scientific developments directly to consumers and closely works with dermatologists to create skincare products that are both safe and effective. The scientific and medical communities have long known the link between skin pH levels and common skin concerns that millions of people experience every day. Our goal is to use this advanced technology to empower consumers with meaningful information about their skin, so that they can find the products that are right for their individual needs. At L'Oréal, we know that health is the future of beauty and we are committed to leveraging technology to bring powerful insights and solutions to our consumers. Guive Balooch, Global Vice President, L'Oréal Technology Incubator. L'Oréal Technology Incubator is a part of L'Oréal’s Research & Innovation Division. The pH scale varies from acidic to basic, on a spectrum determined from 0 to 14. Within the somewhat acidic range between 4.5 and 5.5, healthy skin pH exists. When a pH balance is affected, whether through underlying conditions or environmental factors, it can stimulate inflammatory responses. Such kinds of responses can cause or aggravate common skin concerns such as dryness, atopic dermatitis, and eczema. These conditions are experienced by countless numbers of Americans. In fact, 1 in 10 Americans (31.6 million) has some form of eczema according to the National Eczema Association. My Skin Track pH—a tiny, thin, flexible sensor signifies the next breakthrough in personalized skincare technology for the global beauty leader, L'Oréal. 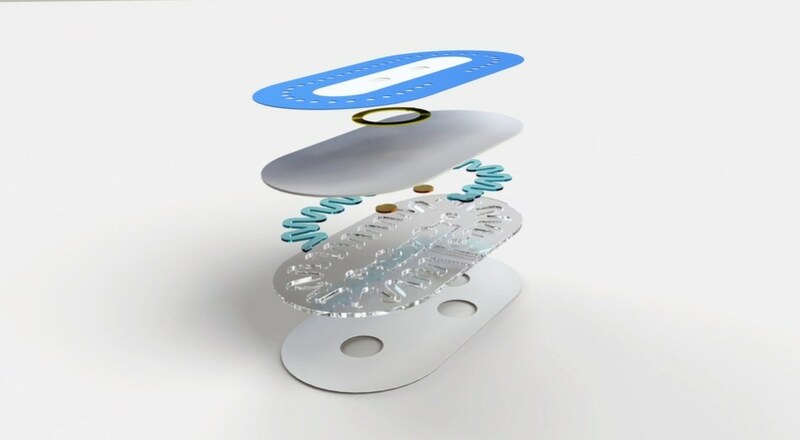 As the first-ever wearable device to determine individual skin pH levels through microfluidic technology, the sensor can capture trace quantities of sweat from skin pores via a mesh of micro-channels, offering a precise pH reading within 15 minutes. While earlier techniques of measuring skin pH levels needed large sweat samples or rigid electronics, My Skin Track pH has the ability to capture and create precise readings from almost undetectable amounts of sweat. The wearer first places the sensor on his or her inner arm and leaves it in place for about 5 to 15 minutes—until the two dots in the center take on color. The wearer then opens the My Skin Track pH app and takes a photo of the sensor. The app uses a sophisticated algorithm to read the pH measurement, and also the wearer’s local sweat loss—the degree of perspiration on the surface of the skin—to evaluate skin health and make personalized La Roche-Posay product recommendations towards better skin care and balanced pH levels. My Skin Track pH, besides its potential as a future consumer product, will assist L'Oréal to develop its studies into the science of skin and help in product development at the largest beauty company in the world. L'Oréal created My Skin Track pH in association with Epicore Biosystems, the industry leader in soft wearable sensors and microfluidic platforms. The novel technology from Epicore Biosystems is based on more than 20 years of soft materials and microfluidic research in Professor John Rogers’ Laboratory at the Center for Bio-Integrated Electronics and the Simpson Querrey Institute from Northwestern University. Epicore is thrilled to collaborate with L'Oréal, an expert in skincare science, to create a new use-case for this technology that drives new research and understanding around skin pH. Roozbeh Ghaffari, PhD, Co-Founder and CEO, Epicore Biosystems. L'Oréal, which has already co-authored a research on the efficacy of microfluidics, will use My Skin Track pH to advance its research via a series of clinical studies in association with Northwestern University. The objective of these studies is to analyze the relationship between the appearance of numerous skin conditions and the pH levels. My Skin Track pH is an advancement development of L'Oréal's attempts to deploy innovative technologies to promote skin health. L'Oréal exclusively launched My Skin Track UV by La Roche-Posay—a personal UV sensor—on apple.com and at select U.S. Apple stores in November 2018. This new prototype represents the next step in La Roche-Posay’s beauty tech journey. We are committed to bringing scientific progress directly to consumers, to help them take great care of their skin. Laetitia Toupet, Global General Manager, La Roche-Posay. Initially, My Skin Track pH will be launched in 2019 via select La Roche-Posay dermatologists in the United States with the aim of gathering new studies and eventually introducing a direct-to-consumer product.